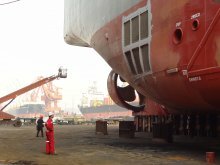 As part of our ongoing commitment to our customers to continually improve our operations and reduce our environmental footprint, CSL embarked on an ambitious fleet renewal program in 2010 that produced 11 newbuild Trillium Class vessels. CSL marked the end of the historic Trillium Class newbuild program with the delivery of the gearless bulk carriers CSL Welland and CSL St-Laurent in late 2014. The program also produced four self-unloading Lakers for CSL’s Canadian fleet (Baie St. Paul, Baie Comeau, Thunder Bay and Whitefish Bay), three Panamax self-unloaders for CSL Americas (Rt. Hon. Paul E. Martin, CSL Tecumseh and CSL Tacoma) and two other vessels of the same class and design for CSL Americas Pool Partner, Norway-based Torvald Klaveness. The new vessels reflect a spirit of innovation that is echoed throughout CSL’s global activities including the recent conversions of the CSL Spirit and the CSL Whyalla into transhippers, as well as the development of the Gravity Transhipment Shuttle Vessel. CSL’s Trillium Class vessels are currently the most advanced self-unloading ships in the world. Equipped to meet the evolving business needs and high environmental standards of customers, our latest generation vessels feature the most advanced technology available in cargo shipping and handling today. Like all CSL self-unloaders, the Trillium Class ships offer exceptional value, speed, versatility and efficiency. Their rapid discharging rate and reduced capital and labour requirements make this bulk cargo handling option an effective and competitive solution that helps keep costs down and minimize environmental impacts.